Thursday July 13th 1899 It was a very warm day. The boys were busy with their work. I am doing a little sewing beside the house work. Am not very well. Friday July 14th 1899 It was too wet to work this morning and Will took the butter to town. I am sewing when not busy with the house-work. Do not feel much better. 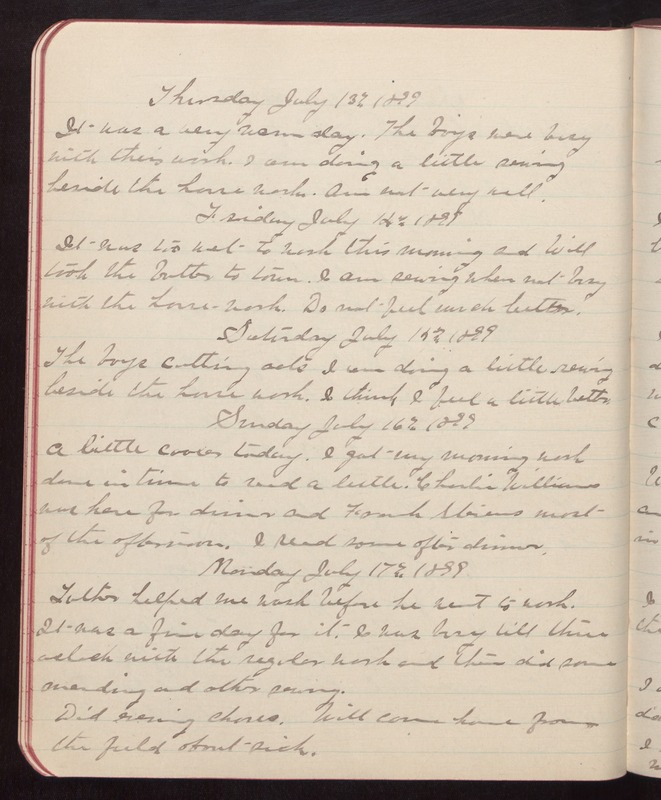 Saturday July 15th 1899 The boys cutting oats I am doing a little sewing beside the house work. I think I feel a little better. Sunday July 16th 1899 A little cooler today. I got my morning work done in time to read a little. Charlie Williams was here for dinner and Frank Stevens most of the afternoon. I read some after dinner. Monday July 17th 1899 Luther helped me wash before he went to work. It was a fine day for it. I was busy till three oclock with the regular work and then did some mending and other sewing. Did evening chores. Will came home from the field about sick.